• Stainless steel double diner bowls are easy to clean and dishwasher safe. Feeding time is the best moment for pet owners to lavish their love and care. To make it all stand out you need the right kind of feeding bowl and Color Splash Oval Fusion Bowl meets your expectations perfectly. 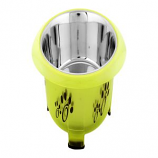 This is a designer stainless steel feeding bowl for dog or cat that is wrapped in colorful PET exterior with cute paw prints on it. What’s more? The fusion bowl has distinct legs with rubber padding, which keeps the bowl a bit raised from the floor. We all know that cats have their own style whether they are napping or happily feeding, so here is a double diner for those pretty cats to purr with satisfaction. The Color Splash Cat Saucer Diner makes every meal easy and enjoyable. The Diner has two saucers to hold food and water or dry and wet food. The high grade stainless steel saucers are also extra strong and hygienic. The ergonomic design of the Cat Saucer Diner makes it easily match with any decor and look as elegant as ever in any environment. Your pet always looks forward to its feeding time, now; make it all the more enjoyable. The Color Splash Rattan Double Diner as the name suggests is a two bowl diner that adds fun and satisfaction to pet dog or cat feeding. The two stainless steel bowls are placed in an attractive plastic, rattan finished rectangular bowl holder. The double bowl is suited for feeding two pets at the same time or one pet with two food items namely dry food and water together. The advantage of the product is that the bowls can be easily removed making it easy to clean or fill them with food. The large bowl holder with its rattan finish looks perfect in any well designed interior and aligns with other decor items. • Bowls are dishwasher safe and hand wash the double diner seperately.